Pattonville High School sophomore Tyler Wright broke another record - this time his own state record he set the previous year. 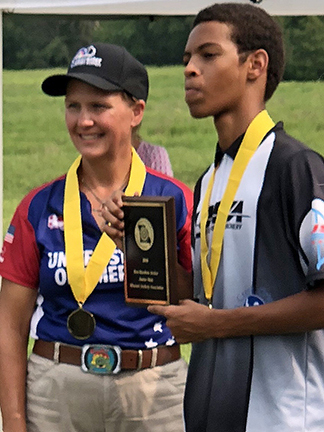 Wright set a new state record when he won the barebow cadet championship during the 2018 Missouri Archery Association (MAA) and JOAD (Junior Olympic Archery Development) Championship in Moberly on Aug. 18. Wright was also named one of the 2018 MAA Archers of the Year, which is based on the combined placement of archers from both the indoor and outdoor state championships. He earned the honor in the junior male category. Wright previously won the 2017 Best Barebow Archer award in the junior male category. The MAA is the National Archery Association (NAA) / USA Archery state affiliate for the state of Missouri. Wright is no stranger to breaking records. As a Pattonville eighth-grader in 2016, Wright was featured in the 2017 edition of Guinness World Records for holding the world's record for largest male afro (measuring 10 inches in height, 9 inches in width and 5 feet, 10 inches in circumference). Wright's hair is shorter now and he no longer officially holds the title, but there is no other current title holder.